Ditch the ladder and shape up the shrubs while you stand safely on solid ground with the 2-in-1 SUN JOE SJH904E Convertible Electric Pole Hedge Trimmer. Lightweight at less than 10 lbs, SUN JOE makes it safe, simple and easy to conveniently clip tall bushes, and shear shrubs and hedges just beyond your reach. Plus, its also great for grooming in tight spaces where a traditional hedge clipper simply cant cut it like between the house and the hedges, or beneath the bushes. SUN JOE's powerful 4.5-amp motor and multi-angle pivoting head allows for precise trimming of most tall bushes and hedges. SJH904Es 19-inch dual action, rust-resistant steel blades cut efficiently in both directions, and the telescoping pole adjusts from 3.8 ft to 5.9 ft for up to 13 ft of overhead reach. And when you're ready to go low, simply detach the cutting head and handle to quickly swap from pole hedge trimmer to handheld hedge trimmer in seconds. This Black & Decker 24 inch 40-Volt Cordless Lithium-Ion Hedge Trimmer features a powerful 40-Volt lithium-Ion rechargeable battery that delivers up to 60 minutes of run-time to help you complete the toughest jobs. The trimmer cuts material as wide as 3/4 inch thick, helping you to get rid of those stubborn branches. The full wrap-around front handle provides a comfortable gripping area in almost all cutting orientations. 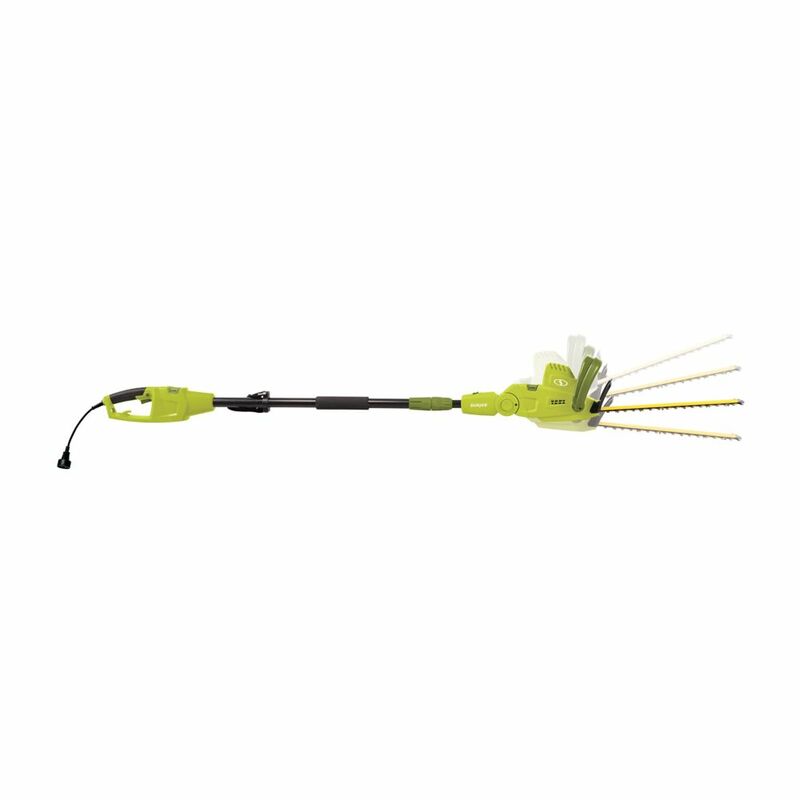 19-inch 4.5 amp Multi-Angle Telescoping Convertible Electric Pole Hedge Trimmer Ditch the ladder and shape up the shrubs while you stand safely on solid ground with the 2-in-1 SUN JOE SJH904E Convertible Electric Pole Hedge Trimmer. Lightweight at less than 10 lbs, SUN JOE makes it safe, simple and easy to conveniently clip tall bushes, and shear shrubs and hedges just beyond your reach. Plus, its also great for grooming in tight spaces where a traditional hedge clipper simply cant cut it like between the house and the hedges, or beneath the bushes. SUN JOE's powerful 4.5-amp motor and multi-angle pivoting head allows for precise trimming of most tall bushes and hedges. SJH904Es 19-inch dual action, rust-resistant steel blades cut efficiently in both directions, and the telescoping pole adjusts from 3.8 ft to 5.9 ft for up to 13 ft of overhead reach. And when you're ready to go low, simply detach the cutting head and handle to quickly swap from pole hedge trimmer to handheld hedge trimmer in seconds. 19-inch 4.5 amp Multi-Angle Telescoping Convertible Electric Pole Hedge Trimmer is rated 4.5 out of 5 by 45. Rated 4 out of 5 by PDK from The Sun Jose 19” hedge trimmer is ideal for reaching... The Sun Jose 19” hedge trimmer is ideal for reaching all those areas I needed to trim but have not been able to reach. The telescoping handle works well allowing me to reach four or five feet above and down a steep slope I have never been able to get to before. The swivel feature provides the right angle for cutting when you are at an odd position to the area your trying to trim. The only issue to note is that when the pole is fully extended to it can a little more difficult to maneuver due to the weight. Overall I’m very pleased with the Sun Joe. Rated 4 out of 5 by grasshopperdodgers from It is winter time. It appears to be in good shape,did not get a chance to use yet. Rated 4 out of 5 by Brad from useful tool it works well, and I like the size of branch it will cut. I used it to trim a 25' tall holly tree and with an extension ladder got everything except the very top, which I did with a regular tree pruner one branch at a time. I can definitely see that it could be overly top heavy and difficult to use for someone without the upper body strength to wield it or the body mass to provide counter-leverage when reaching up and sideways - could tip you over. If you are not big / strong enough, make sure there is nobody else near you when in use, and especially do not use this on a ladder unless you are very experienced with ladder work. What degree of tilt is there as the pole mount? Does it go as far as 90 degrees so that you can trim a flat top when standing next to the hedge?